More than anything else, I think their operating and gross margins will be the focus when they report Q3. Now, to be clear. I am not one to shy away from trading growth type names. I have long been an Amazon (AMZN - Get Report) shareholder, and have been in and out of both Alphabet (GOOGL - Get Report) , and Netflix (NFLX - Get Report) often over the years. I don't remember, however... ever having a long position in Facebook (FB - Get Report) . A quick search of my accounts confirmed that fact, though apparently I have been short the name going way back and have often played the firm's earnings releases through the options market. Facebook will report their third quarter after the closing bell on Tuesday, October 30th. Consensus expectations are for EPS of $1.47 on revenue of $13.8 billion-ish. That revenue number would be good enough for 33.5% year over year growth. despite the firm's warnings in the wake of the July earnings call. The firm also warned at that time on rising expenses. Now, operating margins have been in the mid 40%'s, while gross profit margins, though in recent decline, were still up in the 90%'s. That said, I think these margins will be the focus in two weeks more than anything else. News made the rounds yesterday that the state treasurers of Rhode Island, Illinois, and Pennsylvania had teamed up with the comptroller of New York City to side with a proposal filed back in June by Trillium Asset Management requesting that the firm make independent the role of the chair from that of the chief executive. Though, this firm has stumbled badly through a number of very publicly embarrassing events this year, the facts are that this proposal will go to a shareholder vote in the spring, and that Mark Zuckerberg controls 59.9% of the vote. So, the two roles only will be divided if Zuckerberg feels like it. Nuff said. FYI, I screw around with charts all the time. 99% of my charts are never made public. That said, I was messing around with Facebook last night,, and whoa... something I thought that I would bring to your attention frankly, because I know a lot of my readers trade this name. We all think we know that the FANG names often trade together. Not true at all. Year to date, Netflix is now up 80%, Amazon has returned 55%, Alphabet, a mere 7%, and Facebook has looked like a rented mule running against thoroughbreds at -10%. For those, who include the double "A" in their acronym, Apple (AAPL - Get Report) has run 30% this year. Now, look at the Fibonacci Time Sequence. If you line this thing up with the major selloff in March, it times nearly perfectly with the major selloff in late July. This sequence also indicates that the recent bottom may have been a major turning point as well. 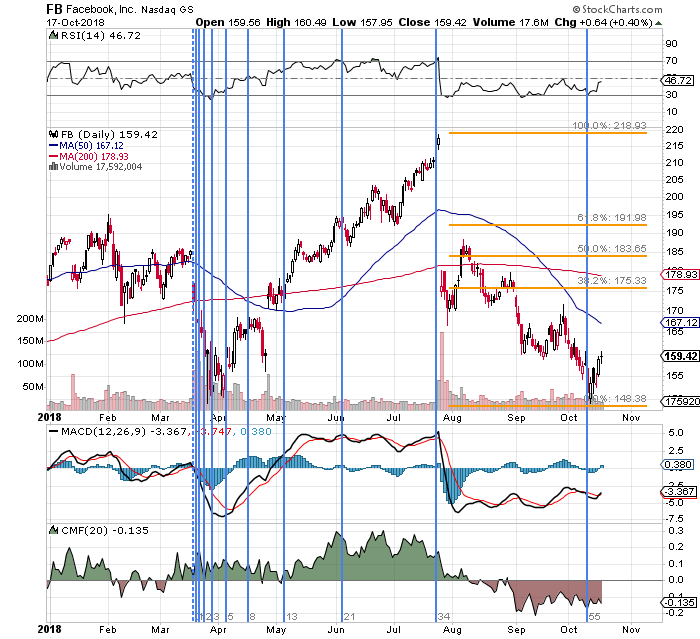 My thought is that if long these shares, a trader has a serious chance at selling them at $175, which would be a 38.2% retracement of the top to bottom July through October move. For my novice options traders, this is a simple strategy known as "Bull Call Spread." Basically, this is a method used to bet on an upward move in an equity, but in a way that greatly reduces the capital risk. The sale of the higher priced call limits the potential profit if the stock does rise above that strike price, but also helps subsidize the loss should the direction of this gamble fail. Bottom Line: In other words, in this example, the trader is risking a little less than $500 to try to net $1,000. Can't do worse. Can't do better. At the time of publication, Stephen Guilfoyle was Long, AMZN, AAPL,, Short AMZN, AAPL put options.